www.ncda.gov.ph, the official website of the National Council on Disability Affairs, won in the Association / Organization category of the 3rd Digital Filipino Web Awards this year. This is the first time that the NCDA site won the award given annually by the DigitalFilipino.com Club whose members judge the nominations from the public in over 40 categories. The official site was designed by MCCID College of Technology. 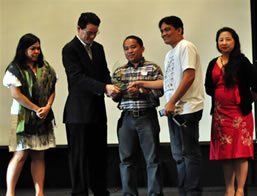 The Digital Filipino Web Awards were given last Friday, November 13 at the Hotel Intercontinental in Makati City. It was part of the Digital E-Commerce Summit, which started in Thursday. The NCDA site award was received by Mr. Dandy Victa, Assistant Chief of Technical Cooperation Division. MCCID College of Technology Training Director Jojo Esposa Jr., gave the 5-minute overview of the website. He also focused on the promotion of web accessibility. The websites were reviewed and judged â€œfor their ability to create a noticeable presence on the Internetâ€”their ability to be seen and heard among all the noise and clutter of the Net,â€ said the award body. â€œThe DigitalFilipino.com Web Awards aims to advocate the use of Internet and e-commerce for business development, through the identification, promotion and highlighting of best e-commerce practices from various websites in the Philippines,â€ it said. Nominations were open from Sept. 19 to Oct. 19.
â€¢ Search engine readinessâ€”title tags, keywords and page strengths. â€¢ Content/organizationâ€”clear purpose, target audience clearly defined, citation of sources whenever used, freshness, originality and accuracy of information. â€¢ Structure and navigationâ€”opening page, content connection and transition, writing and conventions, ease of navigation and link usefulness. â€¢ Design and functionalityâ€”overall layout, colors, background and text. â€¢ Technical performanceâ€”page loading, browser flexibility and live links. To view the complete list of awardees, visit the Digital Filipino Web Awards Official Website. Pede ho kaya humingi rg recommendation o endorsement sa inyo,,isa po akong PWD ,,gusto ko ho sana pumasok sa Government..
Saan kaya may Organization o Association ng PWD dito po sa Valenzuela City? @Jun Espiritu, visisit your local dsws they may help you find a pwd organization that you can join.